Join the discussion on our forums! Come discuss Electra Stormsurge over in our dedicated Electra Stormsurge discussion topic. 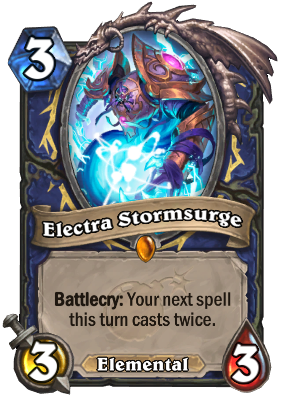 Electra Stormsurge is a great card that can be used in many ways that could be a game changer. Imagine playing Eureka! and you cast two random huge minions in your hand like The Darkness or whatever legendary dragon. The Darkness was not summoned so its battle cry would not be triggered plus you might land two Darkness's with Eureka! Another combo is using fully upgraded Lesser Sapphire Spellstone on Electra Stormsurg and have 7 copies of it across the board, or you can have six copies of any powerful minion of your dreams across the board. Talk about a game finisher! I could go on and on with the possibilities you could create with the latter combos I just told you about, but I will let your own imagination come up with some of your own ideas. My favorite attack quote in the entire game. "RIDE THE LIGHTNING!!!" I love this card. So flexible. 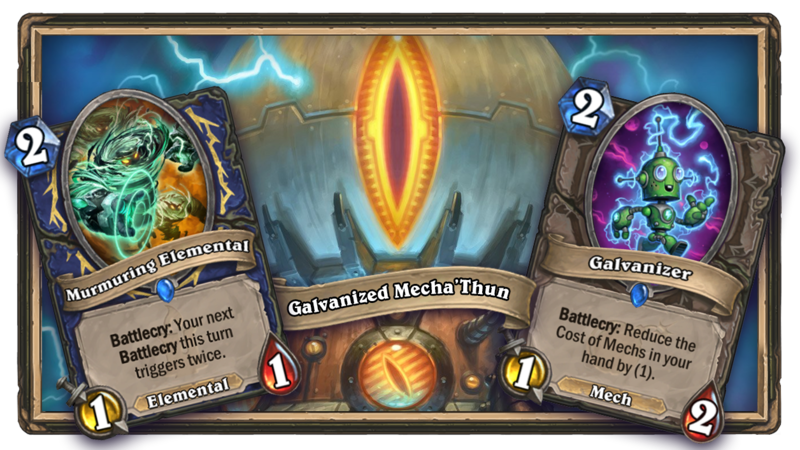 My favorite, although maybe not the best use of the card, is Electra into Earthen Might for a 5 mana 7/7 that generates two random elementals. Two card combo that regenerates it's own loss of card advantage and produces a minion well above the 5 mana stat line. I'm in love. Also have been throwing in the OG Unbound Elemental and whenever you play electra into an overload card, it buffs twice. Great for Voltaic Burst. 4 sparks with rush with elemental tag is well worth 2 overload, especially when doing so gives another friendly minion +2/+2. No that's not joke. He's right, but you answered without context, don't do it. Murmuring Elemental doesn't multiply the battlecry to more than twice. At the end it will cast the first spell just twice. Now I understand why they printed a garbage shaman legendary spell. This card is so busted, cast any spell worth 3 mana or more and the body pays for it self. No1 asked this yet so here I go. How does this work with counter spell? would the 1st cast be countered but second go through??? this + Time Warp will give you 2 extra turns. I have experienced this with Double Time during monster hunt. Auto include until it rotates out of standard once the expansion hits. Play this with Murmuring Elemental to cast your next spell three times Kappa.